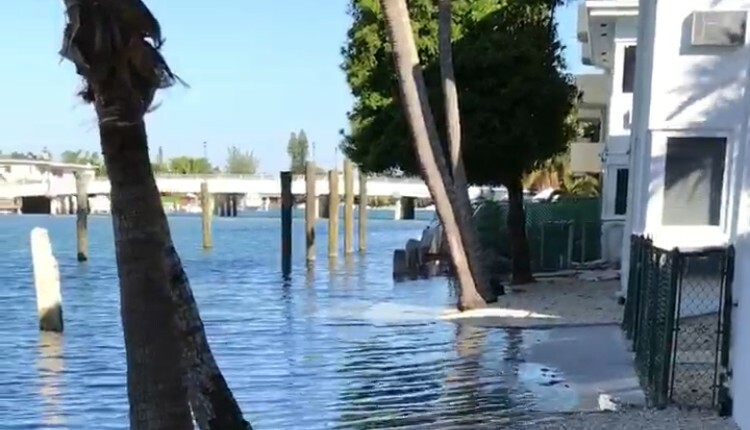 The benefits to that, he said, are reduced flood risk, reduced flood insurance rates, and stabilized values in the flood plain (which describes all of Miami Beach). Scott estimated the City “has around 15,000 buildings, maybe 80% are older, historic buildings,” all at risk due to sea level rise. They are pre-flood map so they’ve had subsidized rates since the beginning of the National Flood Insurance Program, a condition Scott said is soon going to change as the program grapples with $26 billion in debt due to repetitive losses from properties that are below base flood elevation. Bringing rates up to reflect the true risk is going to create sticker shock, he said. For properties with lower elevations, costs are increasing 25% a year until the risk is fully reflected in the costs. “This is going to happen faster than sea level rise,” he said referring to insurance rate increases. Raising a home can make a big difference in dramatically reducing those rates. He gave an example of a client with a $25,000 a year premium who will pay $500 annually once her home is elevated. At the same time, her property value will stabilize. (The higher insurance rates go, the lower the property value.) In Mandeville, elevated homes have 30-40% more value and sell above list price. “You can’t sell the ones on the ground,” Scott said. With 600,000 structures in South Florida alone needing attention, Scott believes banks will ultimately find a way to create different financing options. For now, options include cash, equity, and mortgages with the potential for other government incentives. He calls saving structures from sea level rise “the greatest challenge of the modern era” with huge innovation and business opportunities, which means there will be many people and companies stepping up to meet the challenge. He estimates there is $750 billion in work for his industry over the next 20 years. Drawn by the opportunities here, representatives from three companies, all looking to expand into Miami Beach, made the trip with Scott. The process takes about 60 days from start to finish, though he said some companies have it down to 45 days. Showing a photo of a home with a new, large and “ugly” cement foundation, he said the problem needs an architectural as well as an engineering solution to ensure elevated structures are attractive and fit into the fabric of the community. The big question, of course, is cost. A representative from one of the companies travelling with Scott said, in New Jersey, the average cost is $90-$120 per square foot total depending on the structure. (Earlier in the day Scott told the Historic Preservation Board, “The mitigation projects in the northeast are typically the highest cost and they run upwards of $160 a foot finished.”) Scott acknowledged the potential issues with compromised rebar and spalling as a result of older buildings here having been constructed with concrete mixed with salt water and sand but, he said, “We can fix them enough to elevate them.” Costs, TBD. Jeff Feldman, a member of the Planning Board and a general contractor, was in the audience for the HPB meeting and told Scott he was encouraged but was grappling with the economic challenge. With the need to "hire an architect, a bunch of engineers, all the trades, legal... How on earth can this be economically viable for the owners of a typical property throughout Miami Beach? I’m a general contractor so I know the process and I know the costs…” Scott replied that for someone paying $20,000 a year in flood insurance on top of a mortgage, the benefits of paying for an elevation project ensure it gets done. Feldman asked if the majority of structures were lifted after a disaster, meaning federal assistance was available. Scott said that has generally been the case, which brought Feldman back to the issue of how to pay for projects before a disaster here. “I’m just trying to get my arms around how we do this so we can start doing it, if possible,” he said. The time to elevate, he said, is when you rehab them (not waiting until after a disaster). He said there’s confusion among developers and contractors about the 50% rule for improvement, which requires buildings be brought up to current code if a renovation project costs more than 50% of the value of the property. Developers, he said, would prefer to build new rather than put the money into bringing an old building up to code. Scott argues that elevating a building “is not a substantial improvement” but rather “a compliance project” and doesn’t trigger the 50% rule. She continued, “He’s obviously a businessman. He was here with other business people. He sees an opportunity here and our residents need to see there are solutions and options. All in all, it’s good.” She said, "There's definitely a role here” for the expertise that has been used successfully in other places. As the City works on what it calls its toolbox for homeowners, this is one more option. In this case, one that provided a glimmer of hope to those who attended Tuesday’s session. For Scott, it is about bringing people together to solve the problem: property owners, city leaders, architects, engineers, building trades, and financiers. He knows there’s skepticism, misinformation, and a reluctance to change but he said we don’t have a choice. We have to act in order to survive. At the end of the week, no one seemed ready to concede to all of Scott’s pitch but all sides seemed willing to continue the dialogue.